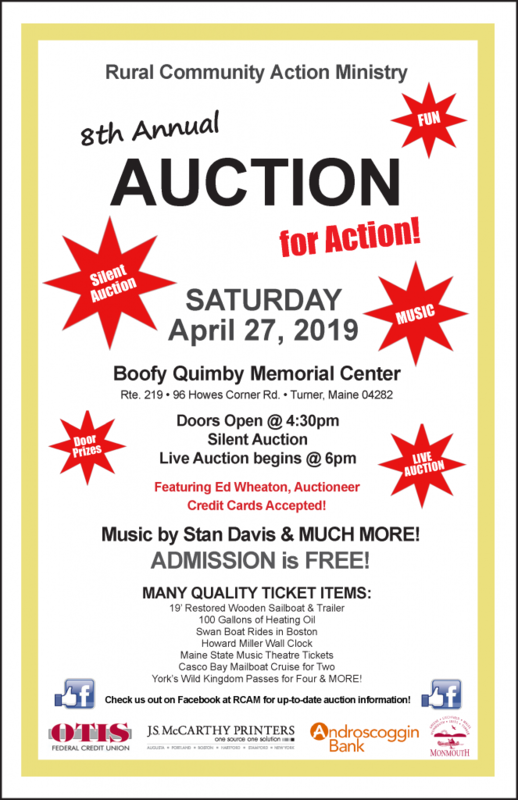 Rural Community Action Ministry encourages readers to Save The Date- Saturday, April 27, 2019 and attend RCAM’s 8th Annual Auction for Action at Boofy Quimby Memorial Center, Route 219 in North Turner. Doors will open at 4:30 p.m. with a Silent Auction, a variety of food for sale, live entertainment with Stan Davis, door prizes and more! The Live Auction, with Auctioneer Ed Wheaton, will begin at 6:00 p.m.
RCAM provides homelessness and hunger prevention services to our most vulnerable neighbors in Buckfield, Canton, Greene, Hartford, Leeds, Litchfield, Livermore, Monmouth, Sabattus, Sumner, Turner, Wales, Wayne, and limited service to Livermore Falls. RCAM’s Auction for Action is a great opportunity to learn more about RCAM services, meet new friends and strengthen our communities. See our poster below and be sure to check us out on Facebook for up to date auction information! Click here to see album of donations!